Dr. K.D. Dvivedi is a reknowned scholar of Sanskrit. Born on 06.12.1918. He is scholar of Vedas, Sanskrit Literature, Linguistics and Indian Philosophy. He has published more than 70 books on Sanskrit Language, Linguistics, Vedas and History of Sanskrit Literature. He has already published 40 volumes in the Vedamritam Series. He has visited U.S.A, Canada, U.K., Germany, France, Italy, Mauritius, Kenya and Singapore on ‘Lecture Tour’. He received Padma Shree award in 1991 from the Govt. of India, for his outstanding contribution to Sanskrit Language. He was Kulpati (Vice – chancellor) of Gurukul M.V. Haridwar. He has served Govt. P.G. 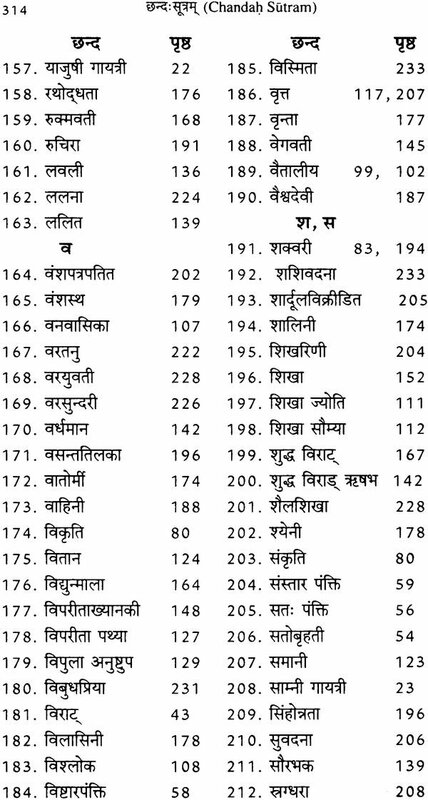 Colleges at Gyanpur, Gopeshwar and Nainital as Principal. He is U.P.E.S. class I Retired. He is known for his books on Sanskrit Grammar, Translation and Essays. He is presently Director of Vishva Bharati Research Institute, Gyanpur (Bhadohi). Professor S. L. Singh was born in 1942 at village Chowkhara of Mirzapur district (U.P). He did M.A. in Mathematics from University of Allahabad and Doctor’s degree from Kumaun University. He has (co-)authored about 180 research papers and four books inclusive of “The Lilavati of Bhaskaracarya”. He has supervised more than two dozens of Ph.D thesis in Applicable Mathematics, Computer Graphics and Vedic Mathematics. Besides being a visiting professor to a couple universities abroad, he has taught at several educational institutions of India and abroad. In 2004, he retired from Gurukula Kangri Vishwavidyalaya, Haridwar (India) as Professor and Principal of Science & Engineering. With a view to serving actively associated with Allahabad Mathematical Society, Indian Society for History of Mathematics and Vijnana Parisad (science Academy) of India. Pingala Naga’s Chandah Sutra is an important text in the history of ideas that is of significance both to scholars of prosody and mathematics. My own interest in it arose from research in the classification of the Vedic metres, for which it is the earliest source, and from the study of history of combinatorics and number representation. We do not know if Pingala was only systematizing an already established body of knowledge or if he was the originator of its. If we accept the latter of these two propositions, then there is no doubt that the Meru Prastara and other series expansions and the representation of binary numbers and their mapping into decimal numbers are two landmarks in mathematical thought for which Pingala deserves to be counted as an immortal in the history of ideas. In an article several years ago in the Bhandarkar Oriental Research Institute (Vol. 81, 2000, pp. 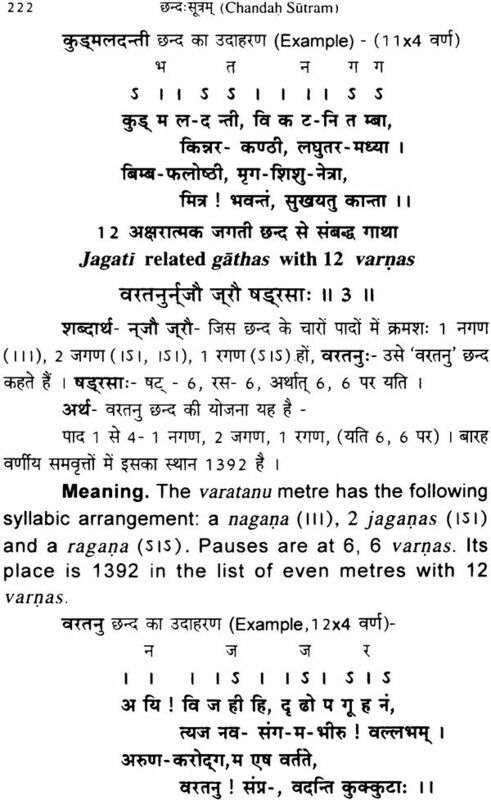 269 – 272), I argued that in addition to these two contributions, the Katapayadi notation, which was widely use in India for word representation of numbers for centuries, also had its origin in Pingala’s for verse feet. We are in the midst of a profound change in our understanding of the Indian sciences. It I emerging that Indian mathematics, astronomy and medicine have been much more influencial outside India than was believed until recently. The influence of Indian sciences to the East through the agency of missionaries and traders is well known; now, it is becoming clear that the influence towards the West may have started as early as the second millennium BC through the intermediary Indic kingdoms, such as that of the Mitannis, that were spread as far as Syria, and networks of traders and artists. In this transmission process, Pingala’s work may be as significant as that of the better known Panini, who was his elder brother if the testimony of Sadguru – sisya, the author of Vedartha Dipika, is to be believed. Pingala’s Chandah Sutra is to combinatorics, sequence and number theory and metres what Panini’s Astadhyayi is to grammer, linguistics and formal system theory. Panini and Pingala, themselves, were at the end of a long series of Rsis and scholars who created the extensive Vedic sciences that covered not only the science of the Self (atmavidya) in the Samhitas, Bramhanas and the Upanishads, but also the subsidiary sciences of Vedangas, Upvedas, but also the subsidiary sciences of Vedangas, Upvedas, Darsanas, and the many specialized Sastras. The Indian sciences are not disconnected fragments of observation and analysis; underlying them is a unique cosmology and vision, which is of enduring relevance to our modern age. 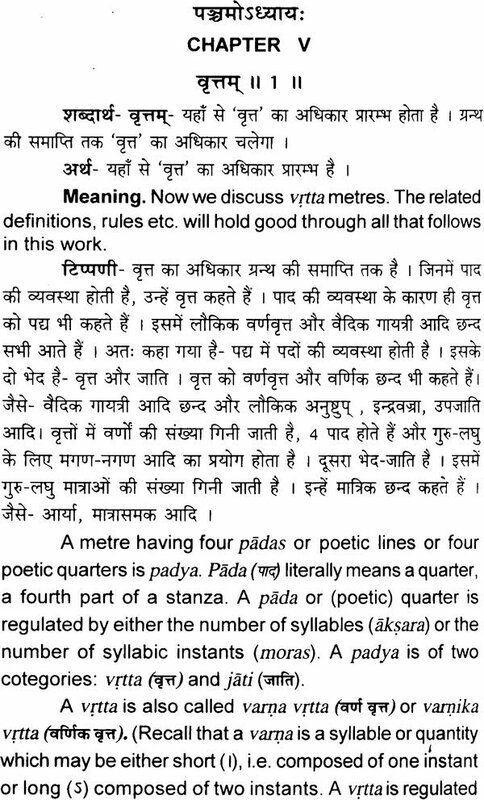 In recent centuries, Indian students of prosody and metres have primarily depended on Kedara Bhatta’s Vrtta Ratnakara. 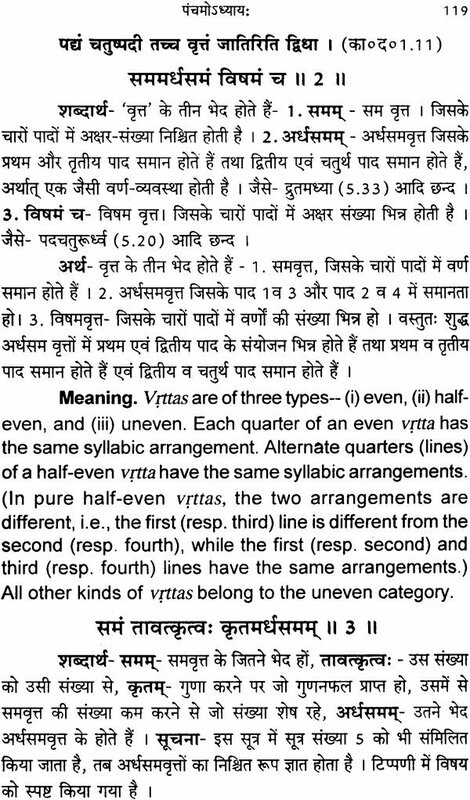 Although this text suffices for the classification of the metres of the Vedic and the classical literature, Pingala’s Chandah Sutras remains of paramount importance for a deeper understanding of the subject to appreciate the earlier sources of the tradition in the Bramhanas. 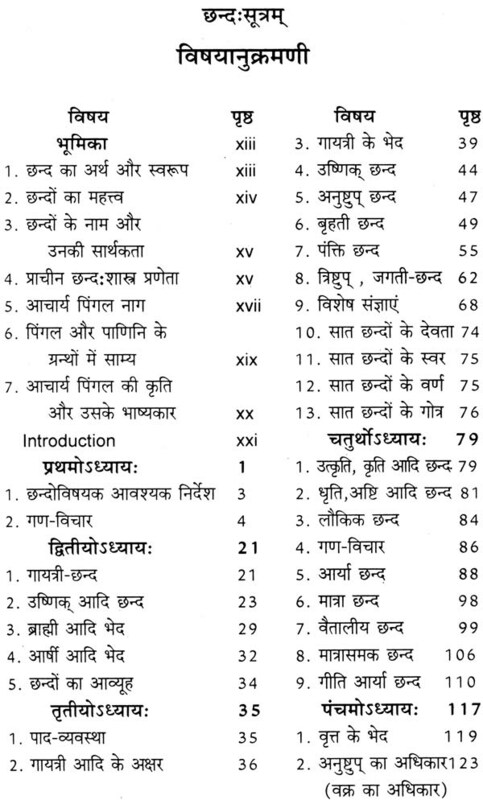 It is for this reason that I am very pleased that Professor Kapil Dev Dvivedi, a well known scholar of the Vedas, and Professor Shyam Lal Singh, formerly head of the mathematics department and Principal of Sciences at Gurukula Kangri University, have combined their formidable scholarship to give a new translation of the Pingala’s sutras in Hindi and English. Their book provides an introduction to the text, translation by word, and contextual meaning of each sutra. Given the worldwide upsurge of interest in the Indian sciences and the arts, this translation by Dvivedi and Singh fulfils an important need. The new translation will make the Chandah Sutra accessible to new generations of scholars of music, prosody and mathematics. It will also make it easier for scientists and the laypersons to know more Indian sciences and wisdom and provide endless hours of pleasure. In 2004, I was inspired to translate Pingala’s renowned work on Prosody into English. 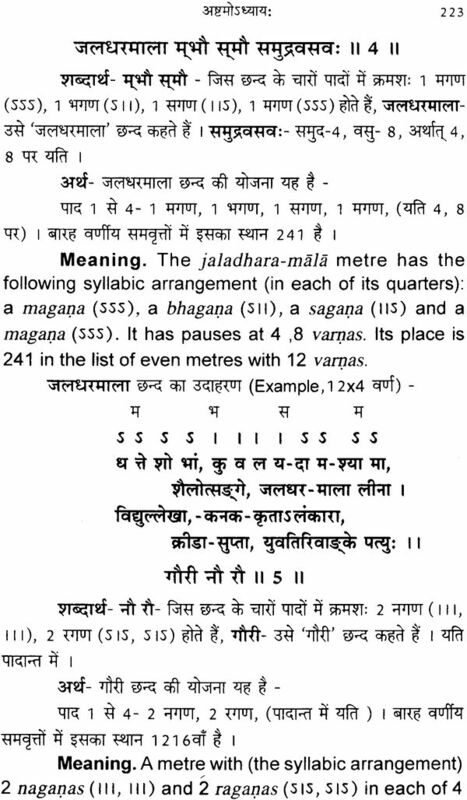 Since I found the task difficult, I requested my esteemed colleague at Gyanpur (Varanasi) Professor Kapil Dev Dvivedi, who not only readily agreed but finished the translation of Pingala Naga’s Chandah Sutram based on its commentary by 10th century scholar Acarya Halayudha Bhatta from Sanskrit into Hindi in record time. I went through his version, compared it with original and made many changes, especially the matter related to Mathematics. Simultaneously, I translated it into English. It gives me a sense of fulfillment to have been able to play this role with Professor Dvivedi who is a great scholar of Vedas and Sanskrit. Prosody is a prime limb of the Vedas. Acaarya Pingala’s exposition on Vedic and classical Sanskrit metres is an unparalleled work in the history of knowledge. He has applied several mathematical formulae in metrics which are much ahead of time. He has to be credited for his fundamental contribution of applying the theory of binary numbers, combinations, geometric progression and Fibonacci sequence to metrics. I believe that his bilingual work can give pleasure and insight not only to persons of poetic taste and lovers of mathematics but to every class of readers, from sophomores to senior citizens. Chanda means metre. Chandah Sastra (CS) stands for prosody or metrical science. 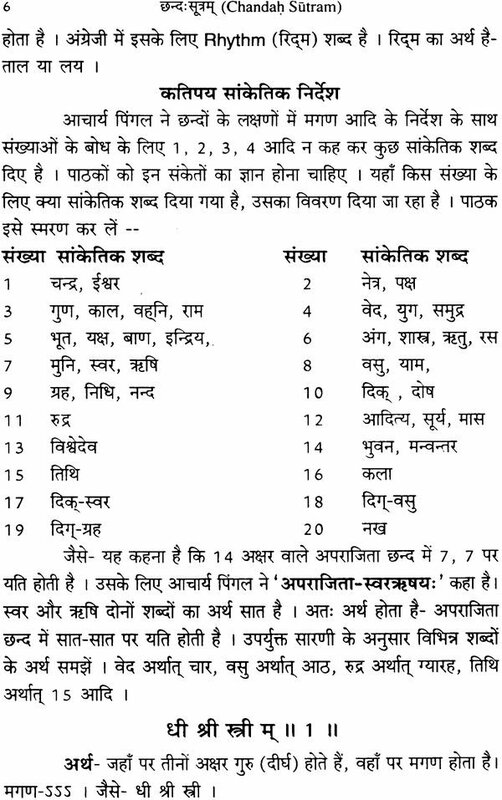 The CS in one of six Vedangas or limbs of Vedas. The grammarian Panini and other top ranking scholars consider Chanda as the base of Vedas. Paniniya Siksa declares "Chandah padau tu vedasya", i.e. chanda connotes the legs of Vedas. There is no poetry in Sanskrit (and other languages poet Dandi emphasizes that the lore chanda is the boat to cross the deep ocean of poetry. In order to understand, appreciate and enjoy or assimilate any poetical importance. Each chanda has its own mood, movement and flavour So, with a view to describing or expressing any emotion, experience, feeling or action, an appropriate choice of a chanda is of vital importance. 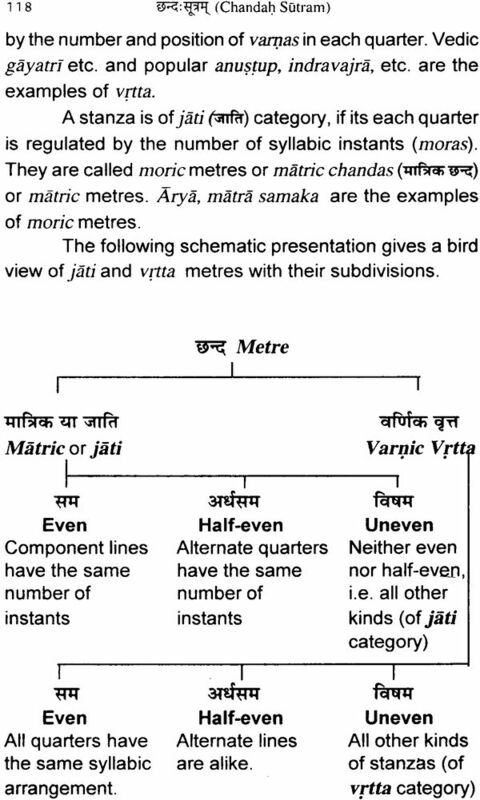 Indeed, the art of metrical composition pervades Sanskrit poetry and the metrical science is the backbone of the crowning glory of Sanskrit poetry. 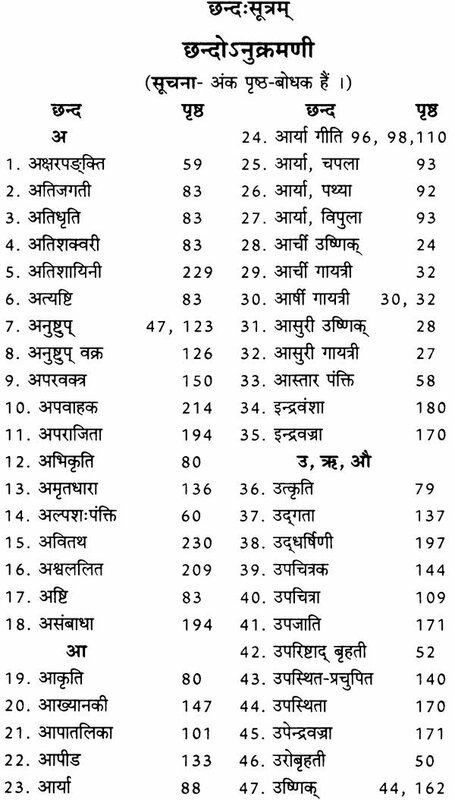 The study of metrics seems an integral part of Vedas and literature auxiliary to Vedas. 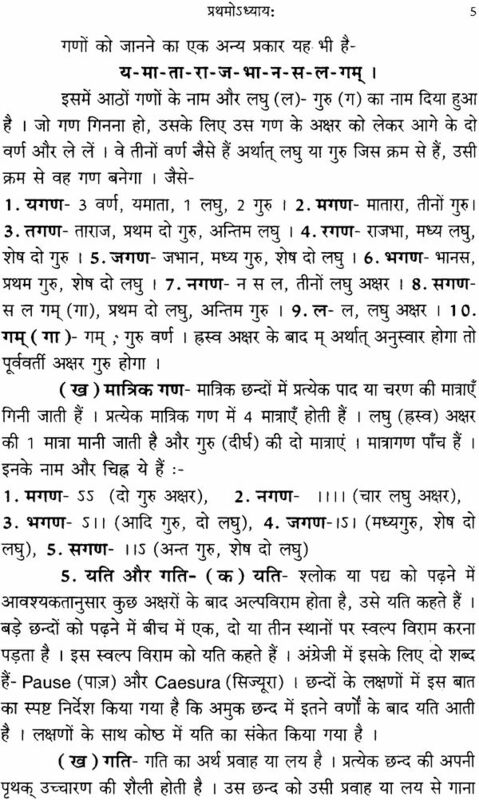 A good description of chandas is found in Yajurveda (14.9, 10, 18, 19 and 15.4.5). Agni Purana (through chapters 328-335), Garuda Purana (chapter 3 of section 3) discuss even metres, uneven metres and methods of pratyayas. 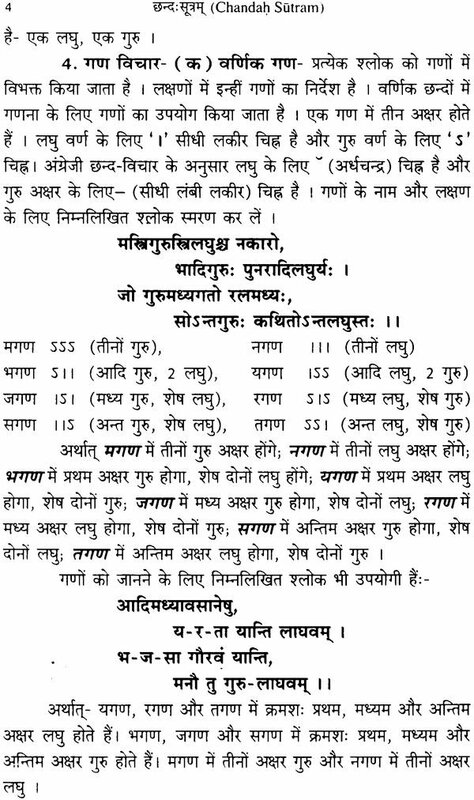 Siva Parvati, Nandi, Guha, Sanatkumara, Brhaspati, Indra, sukra, Kapila, Mandavya, Vasistha, Saitava, Bharata, Kohala, Yaska. 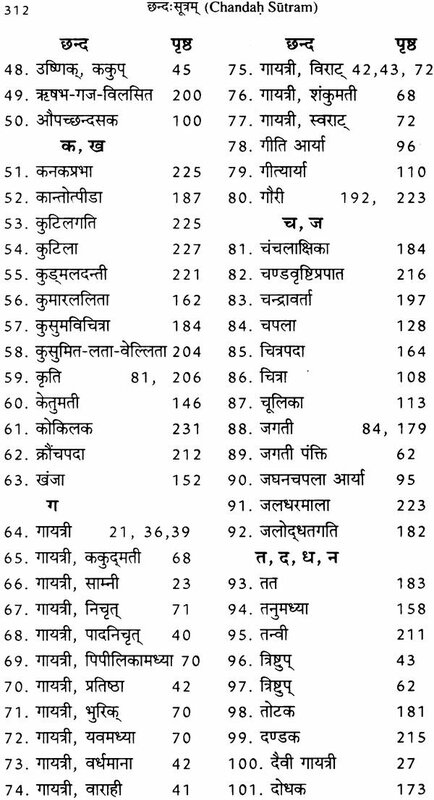 Rata, Krausutki, Kaundinya, Tandi, Avatara, Kambala, Kasyapa, Babhravya, Pancala, Patanjali, Ukthakara. Saunaka, Pingala, Katyayana, Garuda, Gargya, Sankhayana and Venkata Madhava. However, Acarya Pingala has referred the work of some of his predecessors by name. They are: Kasyapa (7.9, i.e. 9th sutra of 7th chapter). Kraustuki (3.29), Tandi (3.36), Yaska (3.30) Rata-Mandvya (7.35), Sakalya (7.9) and Saitava (5. 18, 7. 10). Kraustuki and Sakalya are predecessors of Yaska as Acarya Yaska has cited them in his work on Nirukta. Acarya Bharata Muni. Janasraya Ganasvami, Jayakirti, Kalidasa, Kedara Bhatta, Hemacandra, Gangadasa and Jayadeva. 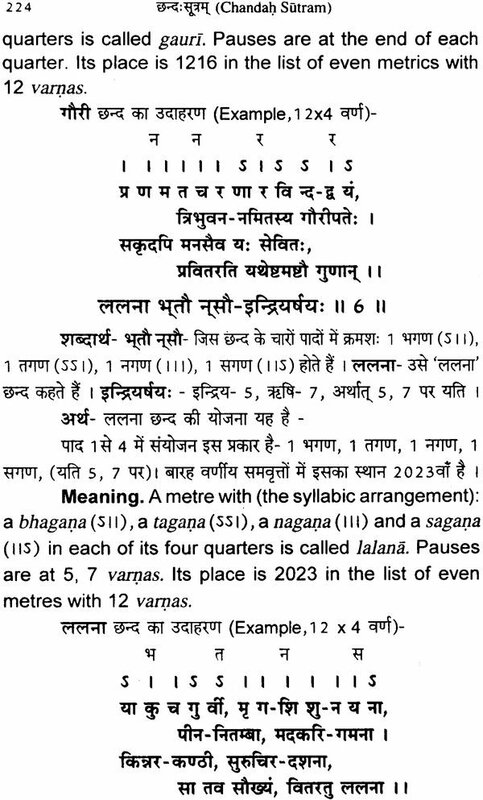 The time of Acarya Pingala is suggested 750 BC or before. According to Vedartha Dipika (circa 1184 AD) of Sad-guru sisya, Pingala is prosodist and younger brother of (grammarian) Panini (circa 750 BC). Daksi and Panin were their parents, Their forefathers lived in Village Salature near Ataka of Present Peshawara district. However, as regards the most plausible time of the two brothers- Panini and Pingala-Yudhisthira Mimansaka in Vaidika-Chandomimansa categorically ascribes before 2850 BC. According to a verse found in Pancatantra, Panini and Pingala were killed respectively by a lion and a crocodile. Of course, there are other similarities between Panini and Pingala. The great work Astadhyayi of Panini is composed in eight chapters, while the Pingala Chandah Sutram (PCS) consists of eight chapters as well. 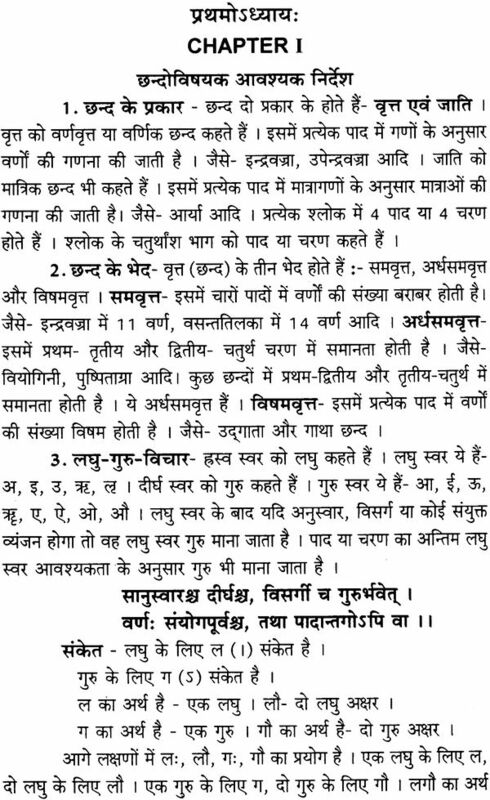 For details, One may to Acarya Baladeva Upadhyaya's Sanskrit Sastron Ka Itihasa. Following the ancient Indian tradition of great Sanskrit scholars, the PCS is composed in terse cryptic language, which can be understood by great teachers having complete mastery over the subject, or else through commentaries written by them. Sanskrit scholar and mathematician Halayudha Bhatta and philosopher Yadava Prakasa (circa 975-1040 AD), the teacher of Ramanujacarya are the earliest commentators of the PCS. 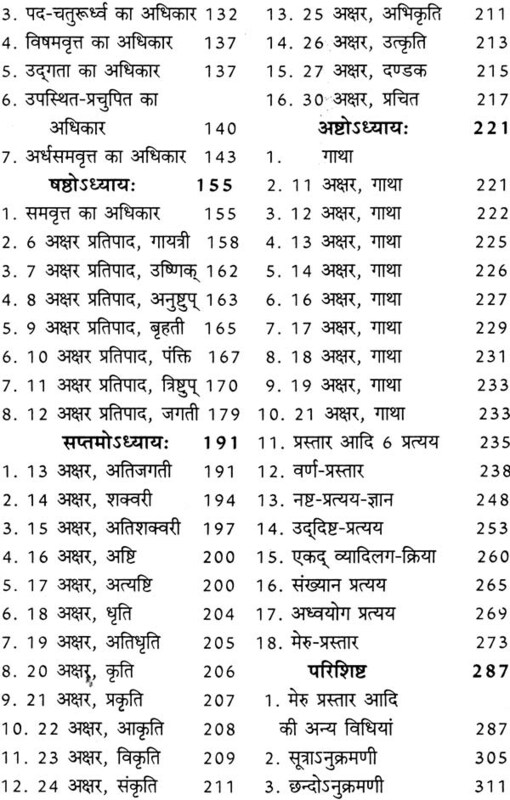 Halayudha Bhattta's commentary "Mrtasanjivani" on the PCS written in 10th century AD. 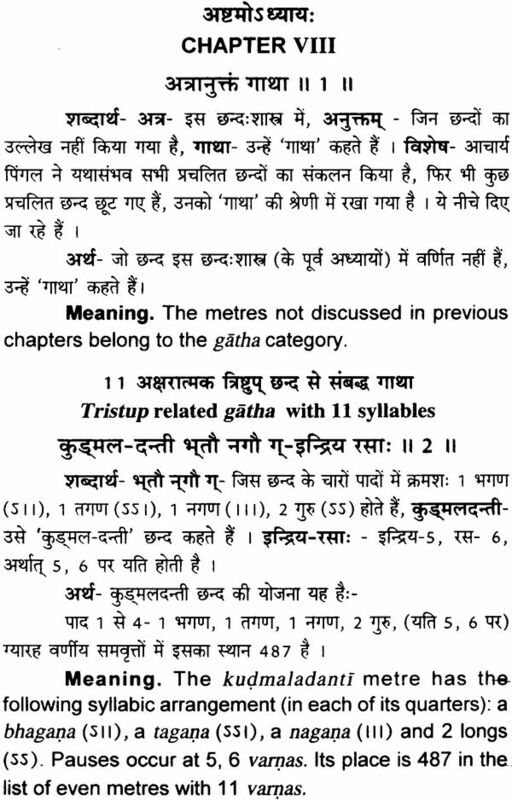 This commentary has been widely used as a popular reference to Sanskrit prosody. 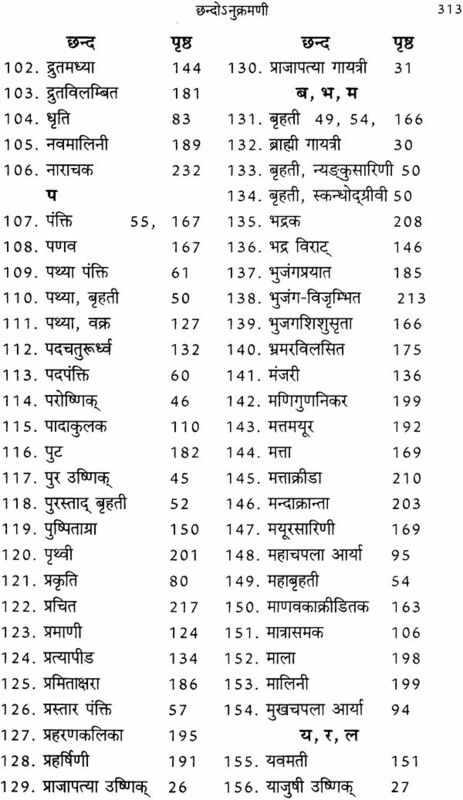 Other commentators are: Nagavarma (990 AD), Bhaskara Raya (circa 1680-1745 AD), his younger brother Saksarama Bhatta, Sriharsa Sarma, Acarya Medhavrata, Akhilanand Sarma and others. However, to the best of our knowledge, Halayudha's Mrtasanjivani has not yet been translated from Sanskrit into Hindi or English. The present work is intended to fulfil the desire and expectations of the large class of readers knowing Hindi or English. 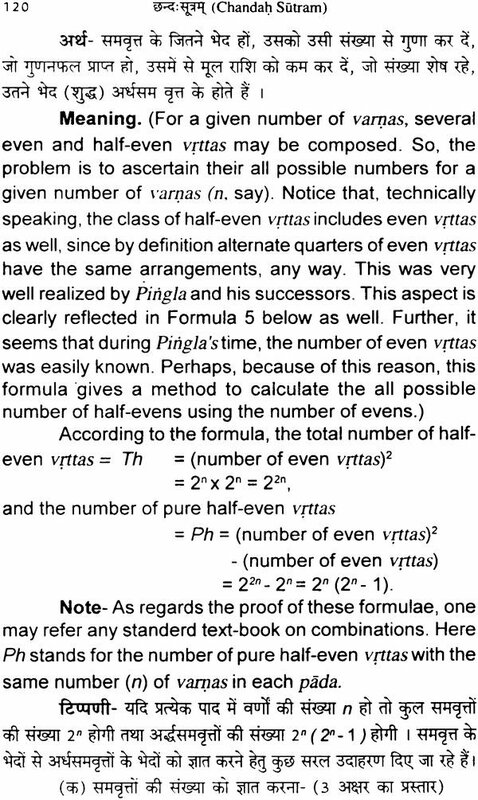 Further, Pingala's computer mathematics discussed in the is book is expected to have a good impact on the history of mathematics.